Facilitation of different attentional functions by nicotinic acetylcholine receptor (nAChR) agonists may be of therapeutic potential in disease conditions such as Alzheimer’s disease or schizophrenia. For this reason, the neuronal mechanisms underlying these effects have been the focus of research in humans and in preclinical models. Attention-enhancing effects of the nonselective nAChR agonist nicotine can be observed in human nonsmokers and in laboratory animals, suggesting that benefits go beyond a reversal of withdrawal deficits in smokers. 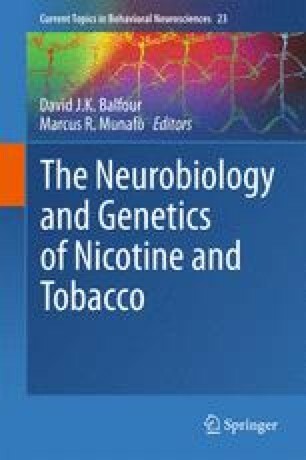 The ultimate aim is to develop compounds acting with greater selectivity than nicotine at a subset of nAChRs, with an effects profile narrowly matching the targeted cognitive deficits and minimizing unwanted effects. To date, compounds tested clinically target the nAChR subtypes most abundant in the brain. To help pinpoint more selectively expressed subtypes critical for attention, studies have aimed at identifying the secondary neurotransmitter systems whose stimulation mediates the attention-enhancing properties of nicotine. Evidence indicates that noradrenaline and glutamate, but not dopamine release, are critical mediators. Thus, attention -enhancing nAChR agents could spare the system central to nicotine dependence. Neuroimaging studies suggest that nAChR agonists act on a variety of brain systems by enhancing activation, reducing activation, and enhancing deactivation by attention tasks. This supports the notion that effects on different attentional functions may be mediated by distinct central mechanisms, consistent with the fact that nAChRs interact with a multitude of brain sites and neurotransmitter systems. The challenge will be to achieve the optimal tone at the right subset of nAChR subtypes to modulate specific attentional functions, employing not just direct agonist properties, but also positive allosteric modulation and low-dose antagonism.